• Protect from reputational, regulatory and financial risks. • Reduce the cost of fraud and financial crimes prevention. • Gain a holistic view of risk across functions. • Include cyber events in regulatory report filings. In this e-book, learn the basics in how to prevent fraud, achieve compliance and preserve security. 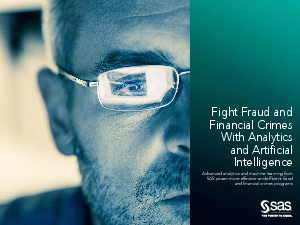 SAS fraud solutions use advanced analytics and artificial intelligence to help your organization better detect and prevent fraud. By applying analytics and powerful machine learning on a unifying platform, SAS helps organizations around the globe detect more financial offenses, reduce false positives and run more efficient investigations.